I've been swamped over the last few months with consultancy jobs, essential IntMath site maintenance and back pain, so I haven't had a chance to write an IntMath Newsletter in quite a while. Thank you for your patience - there's only 24 hours in a day! I recently revised the double springs applet, which is an example of a composite trgionometric curve. From a coding point of view, it's one of the most complicated applets in all of the ones on the site and was quite a challenge. In August there was a total eclipse of the sun passing over the entire USA. 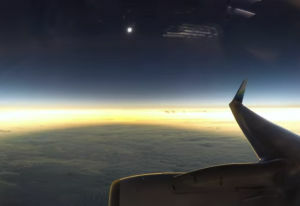 AlaskaAir took a group of eclipse watchers up to get a good view, and they had to make sure they maximized their customers' experience. The math behind the flight is quite interesting. These days, it gets harder to capture peoples' attention, and to "go viral" is the holy grail of most publishers. There are plenty of companies that will help you to get there (for a fee). SearchLaboratory (a search optimization company) has an interesting mathematical take on how they applied a model developed for epidemic prediction in human health to the issue of "how much" and "how many" places you need to promote your content in order for it to go "viral". See especially the section, "Step 3: Applying the Stochastic General Epidemic Model". I've been a lover of maps from way back, and so I enjoyed this TED talk where Danny Dorling talks about several different data visualization maps. The puzzle in the last IntMath Newsletter asked about the angles of the hour, minute and second hands of a clock. Correct answers with explanation were provided by Rick, Chris, Don, and Thomas. As usual, there were an interesting variety of approaches used, including "brute force VBA". Update: A year ago (almost exactly) the Newsletter puzzle concerned a sheep in a circular field. Chris had another go at solving it by finding a few clever integrals, using "SciPy" (Scientific Python) software, which I mentioned earlier in this Newsletter. Example: The n-th term of the sequence 3, 5, 7, ... can be expressed using the formula an = 2n + 1, where n = 1, 2, 3, ... Now try these two. Propose as many formulas as you can to represent the n-th term for this sequence. "In a time of drastic change it is the learners who inherit the future. The learned usually find themselves equipped to live in a world that no longer exists." "The hardest arithmetic to master is that which enables us to count our blessings." 3,-2,3..........Answer is 3 when n is odd and -2 when n is even!! !